I love the vintage look of the rosettes on this wreath and how it appears to give you a look of bombs bursting in air, also known as fireworks on the 4th of July. You can find my tutorial here on YouTube. 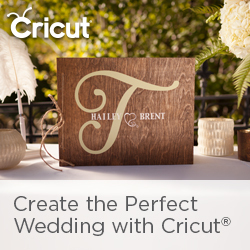 I also use the Cricut® heavyweight chipboard for my wreath base. Here is the wreath file as well.